Thank you PEDIGREE ®DENTASTIX ™follow for sponsoring this post. To learn more about how to get road trip close with your dog, visit Pedigree.com/Dentastix. Let’s take a dog road trip! For my husband and me, summer is a time for family road trips. 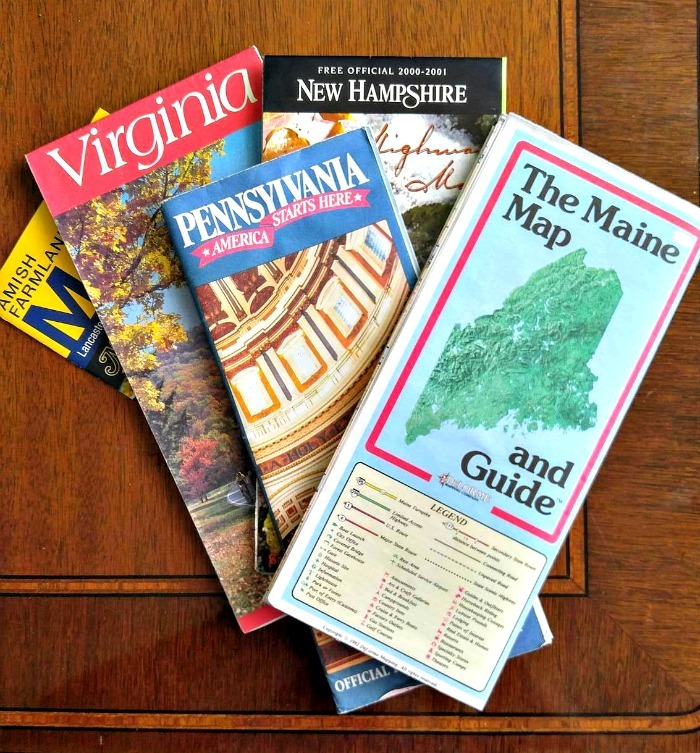 i have a large family in Maine, and my husband and I love to visit them each year about this time. 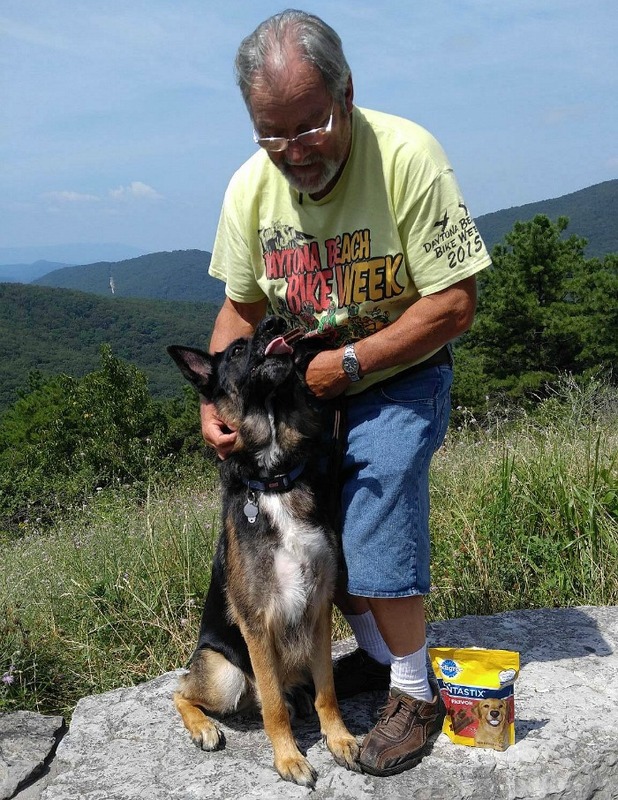 And since Baron, our German Shepherd, is a part of our family, what would a family trip without our best buddy? But traveling with a dog is not as easy as going by ourselves. 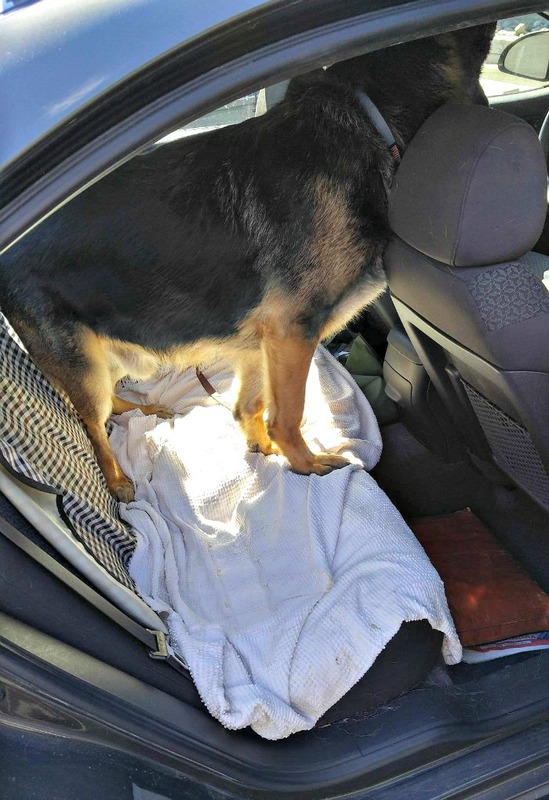 There are lots to things to consider (dog breath in a closed car can be a challenge, for one!) before we head out on the road. Do you have plans for a dog road trip this year, too? These 10 easy tips should cover all the bases and make the trip lots of fun for you and your four legged friend. 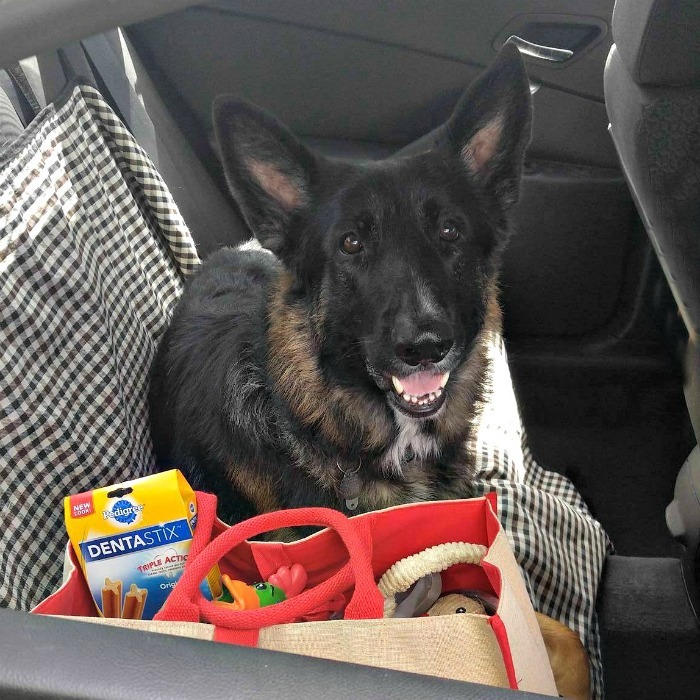 A Dog Road Trip is easy if you follow these 10 easy tips. 1.Think ahead. Having a dog road trip means that some planning ahead of time is in order. It’s a good idea to plan for unforeseen happenings. Think about giving the dog a once over at the vet. If it’s been a while since he has had a visit with the vet, taking your dog in for a check up is a good idea. Take some shorter trips with your dog to make sure he is ready for the longer dog road trip that you have in mind. Even a simple over night stay will get him used to being away from his familiar routine. Plan your route. You’ll want a route that will allow you lots of stops along the way to let the dog get some exercise and stretch his legs. Dogs don’t like being cramped in a car anymore than we do. 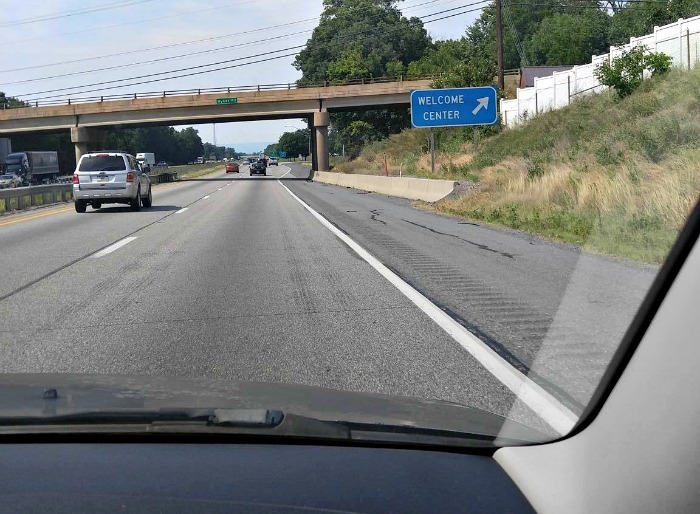 For us, this meant taking side roads instead of the interstate. It took longer, but we discovered that we LOVED travelling this way since we got to see so much more of the country side. Have identification handy. Baron has a microchip, which is a great idea, but having a photo of him, and proof of his rabies shot and dog tags are also some things to make sure to have in case you need them. Make a note of vets along the route. If anything should happen to your dog on the way, you’ll have this info handy. Download some new apps for your phone. 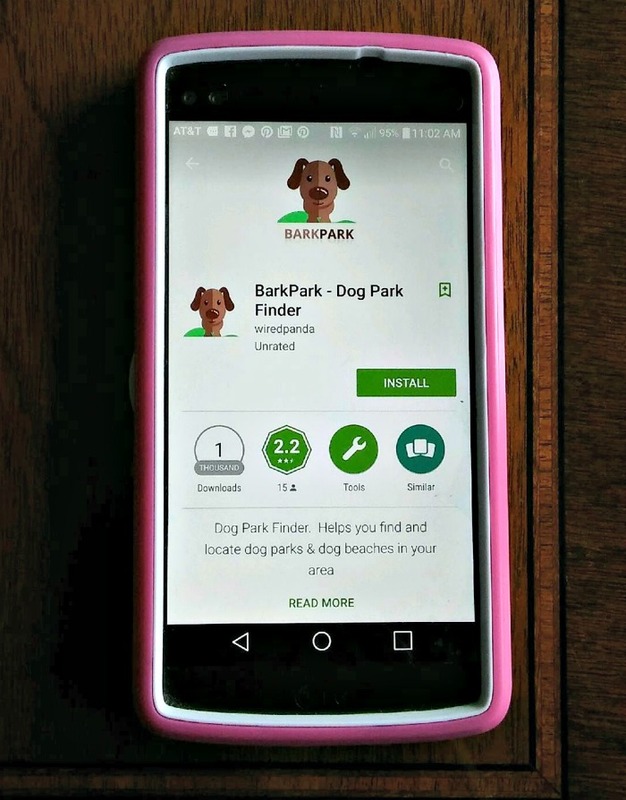 BarkPark – Dog Park Finder is a great app for locating local dog parks, dog beaches or dog-friendly parks along your route. DogFriendly.com Mobile is another great dog friendly app. A few of his favorite dog toys. Baron loves squeaky toys, so these are the ones we brought along as well as a ball. Bottles of water. Dogs get dehydrated quickly in a car, so take frequent water breaks. His favorite dog blanket. We placed this on the back seat on top of a dog seat protector to make the ride more comfortable for him and to have a familiar smell of home. Poop bags – Bring a lot of them! Need I say more? PEDIGREE® DENTASTIX™ Treats. Nothing gets rid of dog breath like these chew-able treats. BARON LOVES THEM!! 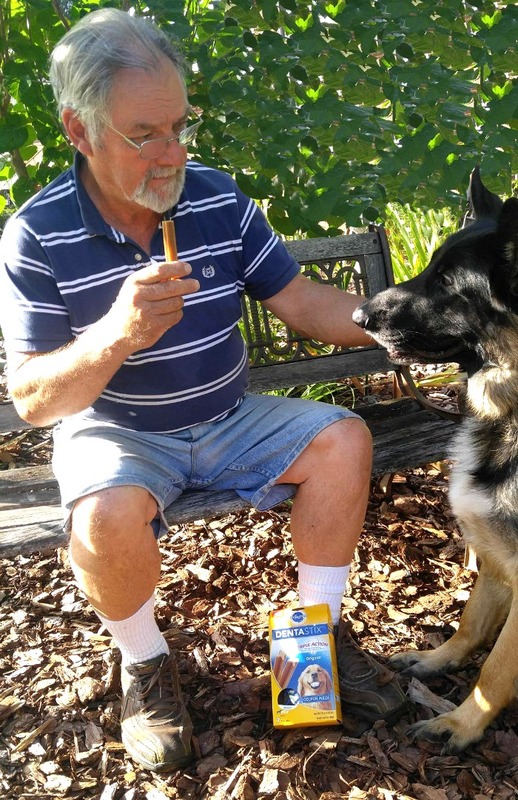 PEDIGREE® DENTASTIX™ Treats help to clean his teeth down to the gum line, which helps to promote healthy gums. The chewy texture helps to scrape way plaque. Having these on the trip helped a lot to get “road trip close” and keep dog breath away. Any medications your dog may need. Dog brush and flea comb. Dog collar and lead. We brought Baron’s regular lead and also a long lead, since my family has a camp at the lake and we hoped to take him swimming. As it turned out, Baron was not a water dog! I think it is safe to say that my doggy bag has met with Baron’s sniff test approval, wouldn’t you agree? 3. Car Safety. The safest way to travel with a dog in to have him in his crate. Since we were taking a car and Baron is a HUGE dog, this was not possible. We did the next best thing. We packed the crate behind the front seats. 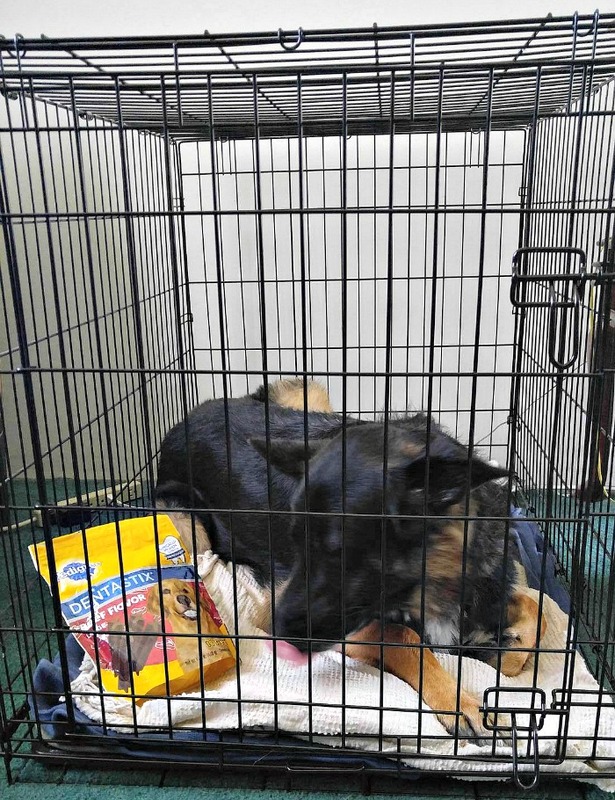 This gave him some forward protection in case of stops and made him feel secure, since he loves his crate. 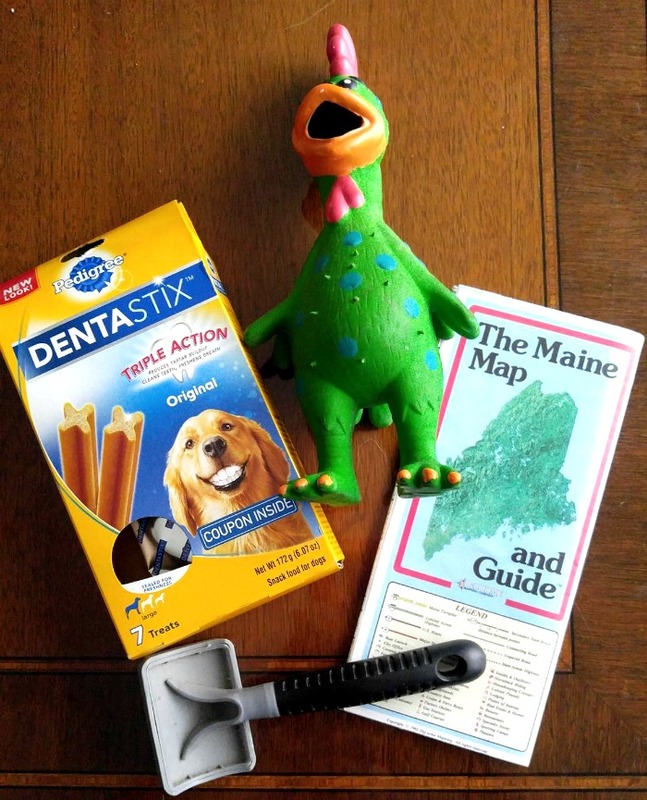 It also gave him a place to stay in the motel room and when we arrived in Maine. 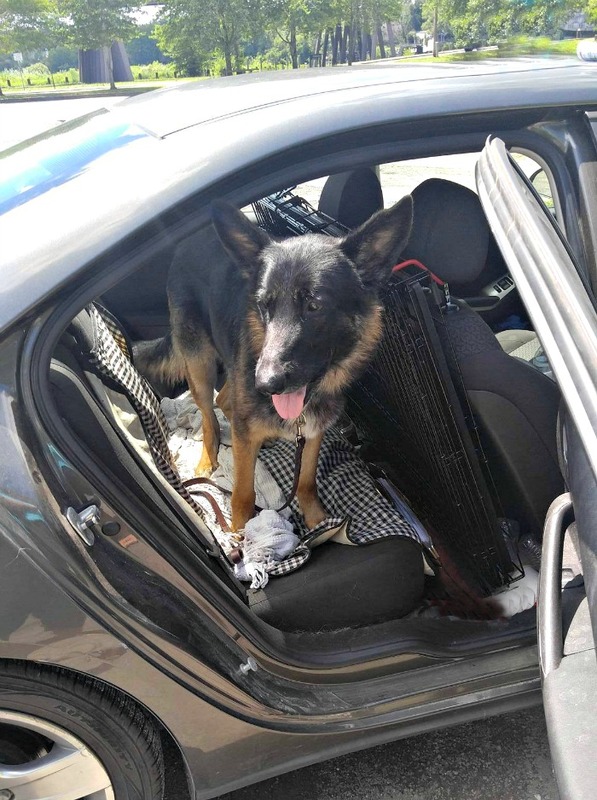 NEVER leave a dog alone in the car, especially in the summer when the inside of the car can reach deadly temperatures in just minutes for a dog. Make sure the room is large enough for a good sized crate if you have a large dog. 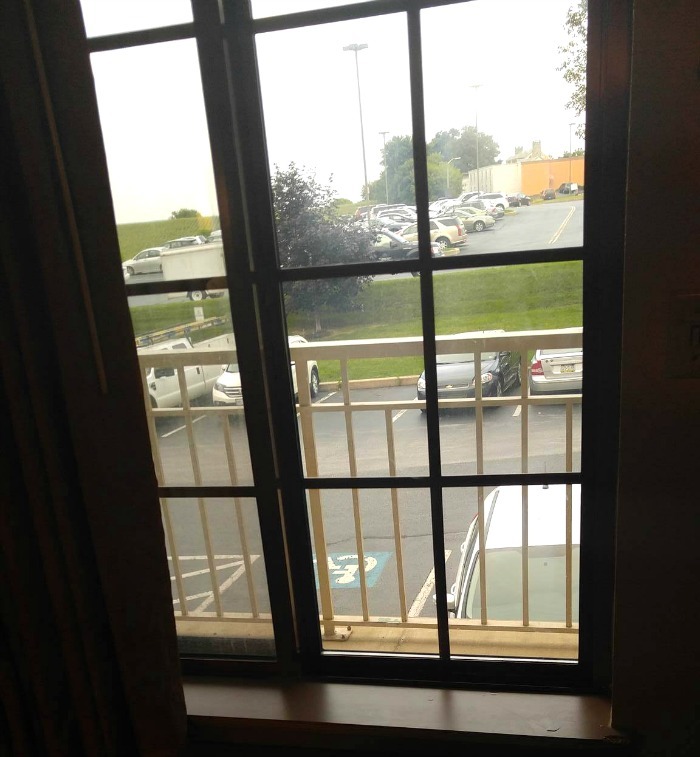 A window in the motel room is helpful. It allows your four legged friend to see you when you are loading and unloading the car. 5. Overnight tips. Remember that the motel room is not a familiar place for your pet. But there are many things to help make your dog less fearful. Take a long walk with your dog as soon as you get to the motel. Remember, a tired dog is a happy dog. 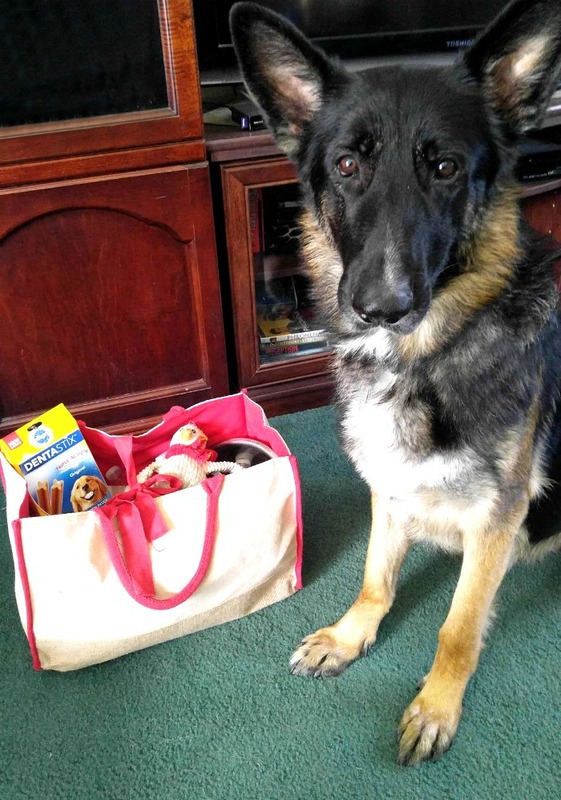 Even if you are staying for just one night, bring in your dog’s favorite things. That will help to make the room feel more like home to your dog. Check the room to make sure that there is nothing in the room that could harm the dog, such as loose wires or other hazards. Make several practice runs if you leave the dog in the crate in the room while you go out for a meal. 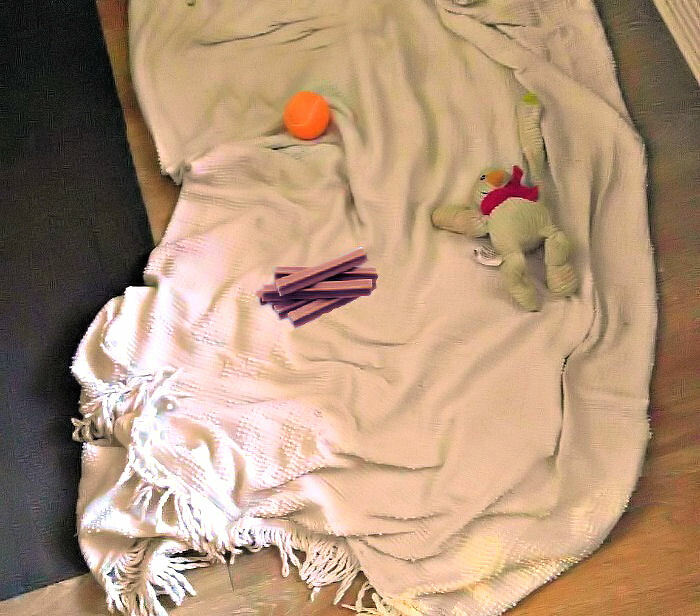 The first few nights, we did about 10 different types of tests before leaving him. Once a dog is settled, they will normally remain that way. If you don’t feel you can leave the dog alone, consider bringing take away food back to the room for meals. 6. Take Plenty of Rest Stops. We found that Baron was always thirsty on our trip. We made sure to take lots and lots of stops at rest areas along the way. Be on the lookout for rest area signs. These are mainly on the busiest roads and almost always at the entry to a new state. If you can’t find a rest area, use your phone. 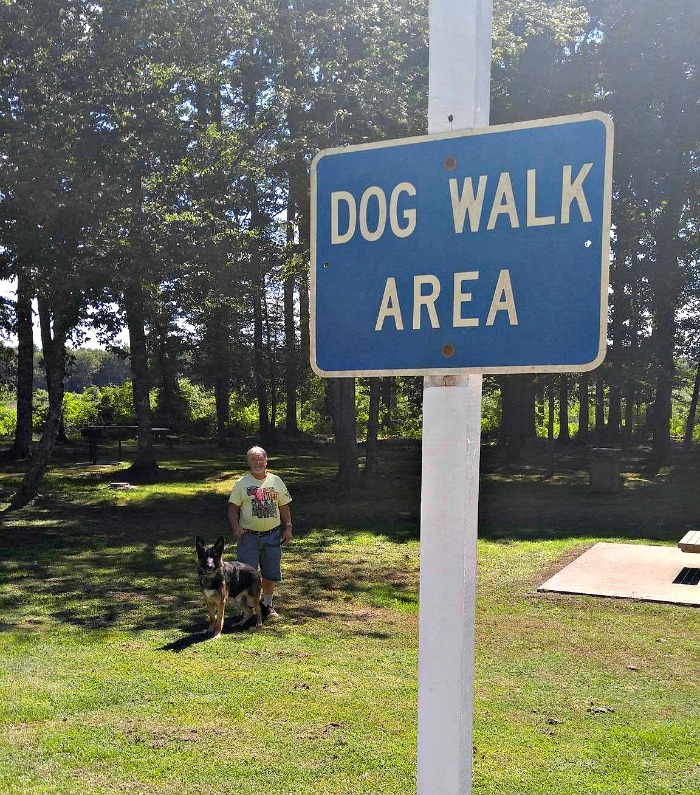 When we wanted to stop, we looked to see where the closest rest area was so that we could give Baron a drink and allow him to stretch his legs. Clean up after your dog. 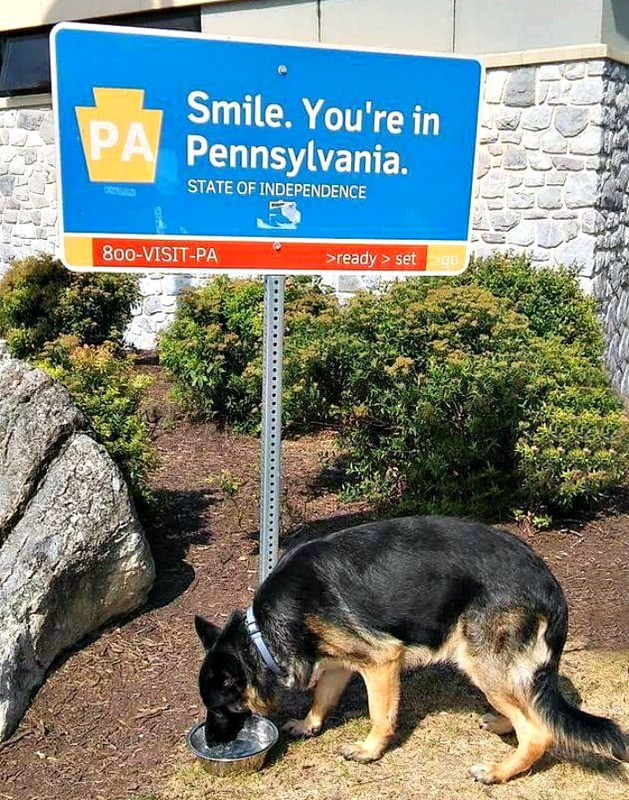 Some dogs never feel like potty time on the road, but that was not Baron’s problem. Be sure to have lots of dog poop bags on hand! Make sure to make fun time for your dog. Let him make friends with other dogs and people that you meet along the way. 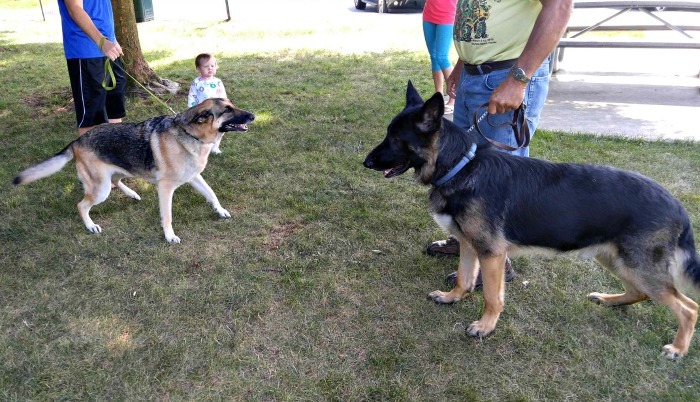 This German Shepherd looks frightened but she and Baron made great friends in just a few minutes! 7. Meal time tips. The biggest problem that we found on our dog road trip was how to eat without having takeaway food for every meal. There are plenty of dog friendly motels, but finding dog friendly restaurants was another story. Phone have lots of tips. A data phone is such a life saver on a trip. “pet friendly eating,” “dining with outside eating,” and “take away diners” became our favorite search terms! 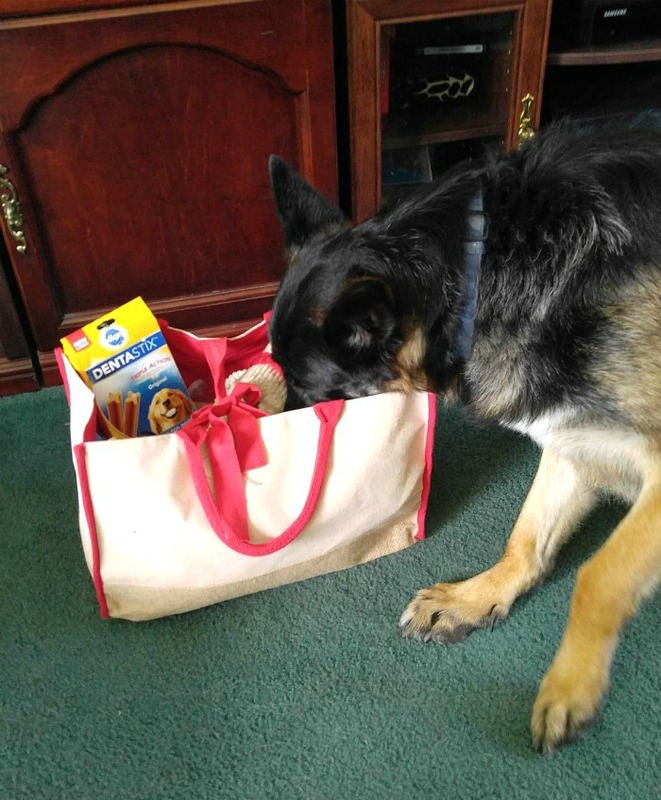 Reward your dog for being a good car rider with his favorite PEDIGREE® DENTASTIX™ Treats after you stop for lunch. He deserves it and it will make the afternoon care ride dog breath free!! 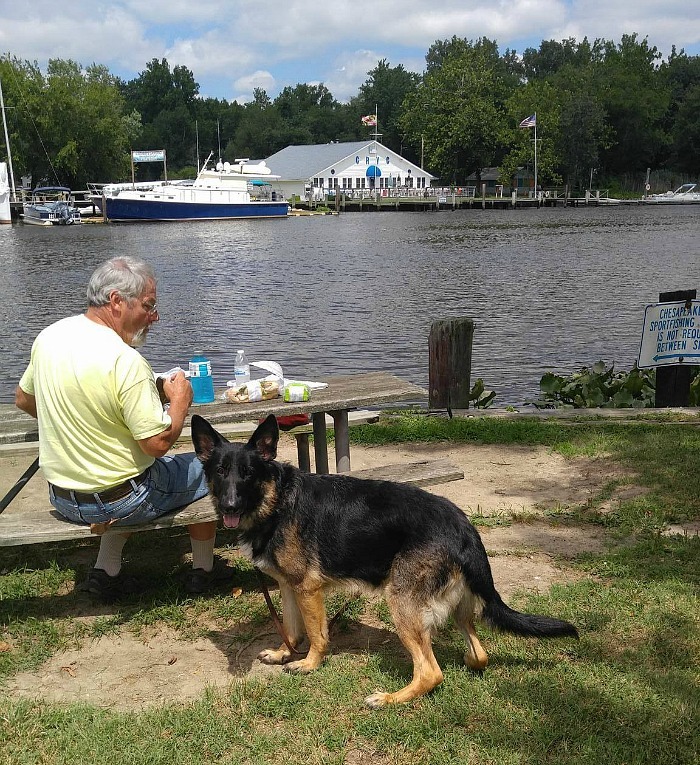 Be on the look out for local picnic areas. We went to a take away restaurant for one meal and Richard asked a local for the location of a local park. She directed us to an area that had wonderful covered picnic tables. 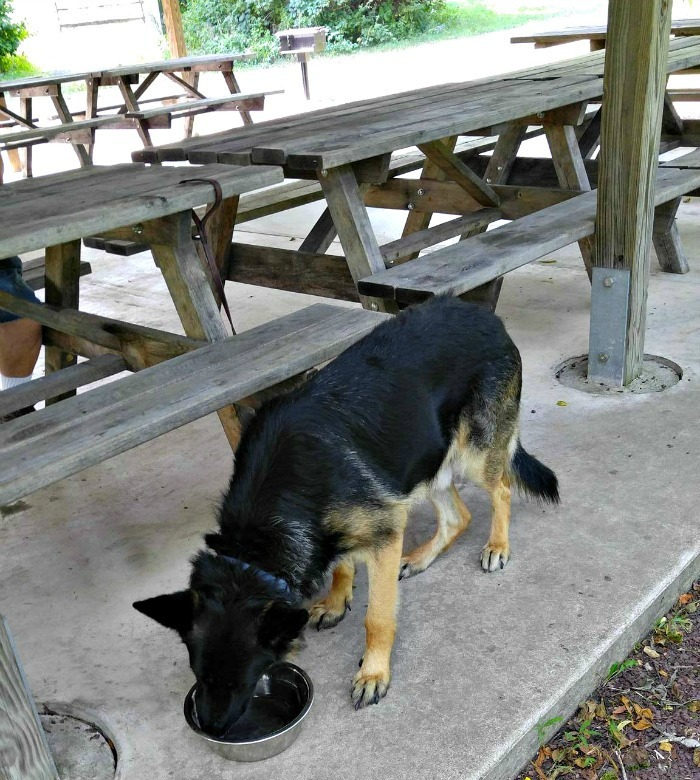 Be sure to always offer water when you stop for a noon meal, even if your dog does not eat then. Really watch your passing landscape for suitable places to eat. It’s amazing where a picnic table can be found. This one was on the way back on our last day, along the Chesapeake river in Maryland. It turned out to be one of the best places for us to eat during the whole dog trip. For more than just a picnic, search for restaurants with outside eating, then give them a call. We found a wonderful place in Maine called Sebago Brewery where we had a lovely meal in their outside dining area. 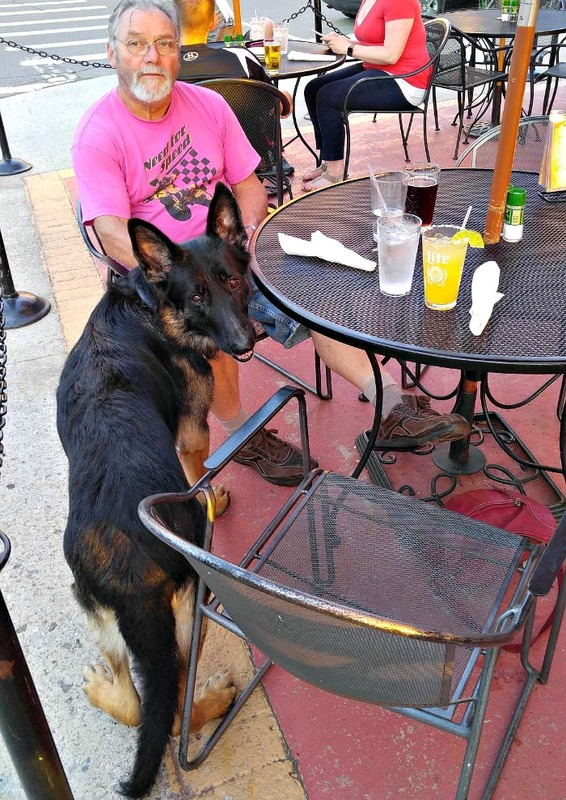 It made a nice change to have a really nice meal and Baron loved watching all the people and other dogs walking nearby. 8. Upon Arrival at your destination. If you will have to leave your dog for any length of time, check out local boarding. Dogs can be very fearful in unfamiliar places and will miss you terribly. We were lucky that we were able to have Baron with us the whole time. (we just took his crate with us each day) But if you need to be away for hours at a stretch try to find professionals who can board him while you will be gone. My family members in Maine are all dog lovers and had numbers for their vet and boarding places handy if we needed them. 9. Maintain your routine. It won’t be possible to do things on a dog road trip exactly the way you would do them at home, but consistency helps. The more you do familiar things with your dog, the better. 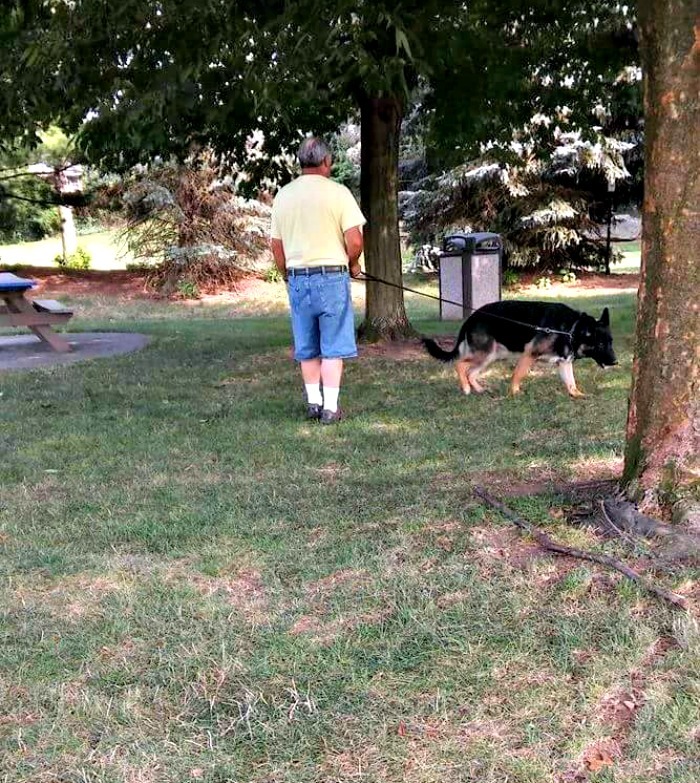 Feed and walk your dog at the same time as you would at home. Make bed time as much like home as possible. If possible, walk your dog more to help him get rid of the extra excitement and anxiety of the trip. Remember to take LOTS OF WALKS. They go a long way towards making the dog feel as though this experience is a lot of fun and also help to release energy and make them more settled! 10. Have fun. A dog road trip is supposed to be fun, not a challenge for him and your family. By following these rules, you will know that you are ready for your dog road trip. Kick back, have fun, and most of all, ENJOY THE TIME TOGETHER! 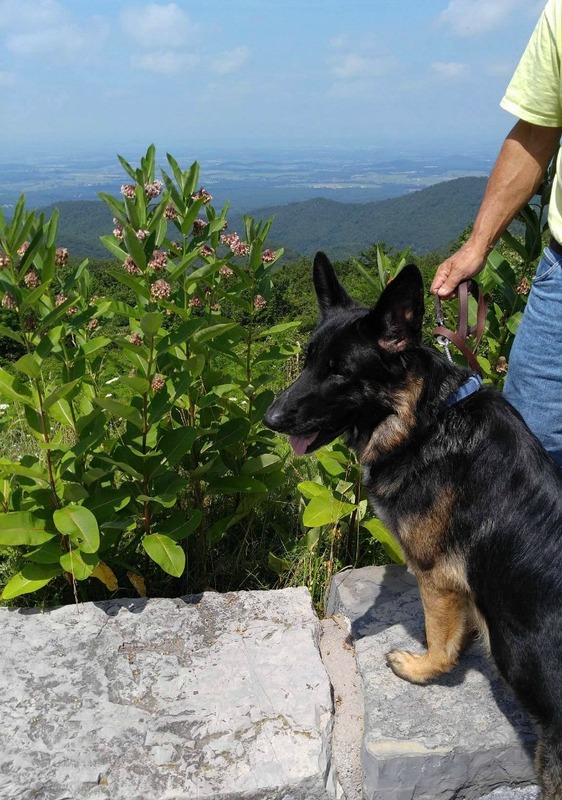 Baron had a GREAT TIME enjoying the view overlooking the Shenandoah Valley. I think he liked it as much as we did! Need a reminder for your next dog road trip? Print out this free graphic to make sure you remember everything you need to do. Have you taken a road trip with your four legged buddy? How did it go? I’d love to hear about it in the comments below. For lots of other household tips, be sure to visit my Pinterest boards. I liked your dog trip tips. We live in Calif and recently went for a short weekend trip to Newport Beach. We found dog friendly restaurants on Yelp. Found out Maisie our dog was terrified of the beach but enjoyed a boat trip on the harbor cruise tour. Hi Carol Maisie didn’t like the crashing waves and water coming at her. She doesnt mind water. It looks like your trip is close to my upcoming trip, NH to VA Beach. Any suggestions for where to stop or not stop? Hi Jocelyn. We didn’t have a set tour in mind when we started out, so I did not keep track of where we stayed. This is the first time we have done it this way and we thoroughly enjoyed it. We just used the Red Roof guide so that we’d have a good place to stay that didn’t charge extra for Baron. The eating out was the hardest part. Very few places are dog friendly unless you know the area well.